Srila Bhakti Sundar Govinda Dev-Goswami Maharaj has commented that if we seek to understand how to apply in our personal lives and within our Missionary community the teachings of the earlier acharyas of the Rupanuga-sampraday and the scriptures of pure devotion (Sri Chaitanya-charitamrita, Srimad Bhagavatam, Srimad Bhagavad-gita, and so forth), we should not look above Srila Bhakti Siddhanta Saraswati Thakur. This is to say that the teachings of Srila Saraswati Thakur are of foremost authority in this regard. In an effort to fulfil the desire of Srila Acharya Maharaj, assembled below on this page is a series of posts organised by theme which present English translations of these Bengali texts. Answer: The service of Sri Guru-pada-padma (our dearly beloved Gurudev) is first of all necessary. In this world, even to obtain piety, knowledge or one’s various other (non-devotional) desired ends, a guru is necessary. However, the knowledge given by all these gurus yields extremely insignificant ends. Our spiritual Guru–pada-padma is not a giver of insignificant ends. Our Guru-pada-padma is a giver of true spiritual welfare. The moment one becomes devoid of the mercy of Sri Gurudev, all sorts of other (non-devotional) desires emerge. 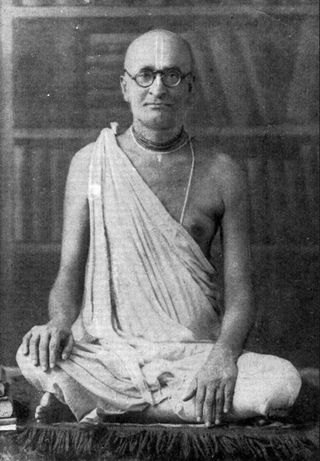 If devotees who are fixed in devotion to Sri Guru (Guru-nishtha Vaishnavs) do not instruct us how we must take shelter of our Sri Guru-pada-padma, how we must behave with our Sri Guru-pada-padma—if they do not teach us all this, then we will certainly squander a jewel we have already obtained. The jiva soul should engage exclusively in the the service of the Lord with their heart (prana), wealth (artha), intelligence (buddhi) and speech (vakya). The service the Lord is the supreme good (mangal), and aversion to the service of the Lord is the root of (all) misery (duhkha). Question: How does actual service to Krishna (Krishna–seva) happen? Answer: Actual service to Krishna (Krishna–seva) happens only through the service of Krishna’s devotees, viz. Guru and Vaishnav. Sahajiyas are not able to understand this. They think, “One who worships Krishna (directly), he is the greatest” and thus they consider themselves Vaishnavs, take service from others and themselves abandon the service of Guru and Vaishnav. However, one who has heard the teachings of Sri Chaitanyadev and the Goswamis knows that truly truly the service of Krishna (Krishna–seva) happens only through the service of Krishna’s devotees, viz. Guru and Vaishnava. Those who abandon the service and guidance of the sadhus and Sri Guru (Sadhu-Guru-seva and anugatya) and feign the service of Krishna (Krishna–seva) and the service of the holy Name (Nam-bhajan), make offences (aparadha) with every step they take. Whenever one is making offence (aparadha), they are not chanting the holy Name of Krishna (Krishna–nam) or engaging in the service of Krishna (Krishna–seva). On the contrary, all surrendered devotees who proceed under the guidance of Guru and Vaishnav and serve them (practice Guru-Vaishnav anugatya and seva) (in truth) serve Krishna and chant the holy Name of Krishna, by the mercy of Guru and Krishna. Only those who serve Krishna’s devotees, viz. Guru and Vaishnav with faith and affectionate love (adara and priti) receive the mercy of Sri Chaitanyadev and the Goswamis.